Either side clings to glass, front or back.TRUE STATIC CLINGS - NO ADHESIVE! 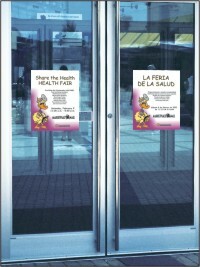 Our static clings will cling to clean glass or most other clean glossy surfaces without adhesive. Mount just about anywhere—doors, windows, mirrors, display cases, and glass railings. Eco-solvent printed on white true cling vinyl. For super smooth, bubble-free installation these may be wet applied. Standard Production Time: 2-3 business days after art approval. For Mirror Clings order white clings with back to glass mounting. For Window Clings order white clings and specify inside or outside of window mounting. For cold weather conditions, we recommend our low tack adhesive clings. SETUP FEE: A $25.00 setup fee applies to orders of 95 items or less of a given design and layout. The setup fee is waived for this design if it isn't customized (your logo is always included at no additional cost). Setup fees are automatically added to your shopping cart.